The connection between music and medicine: A recent article by the CBC reports a strong link between success in medical school and early training as a musician! Musicians learn to constantly reassess, reflect on what they did well, and determine what improvements need to be made - all skills which make for an excellent physician or surgeon [and YC2 adds, every other vocation too!]. 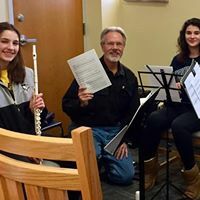 One student interviewed stated, in particular, playing chamber music helped prepare her for the culture of medical school: “When you play chamber music, you are required to show up prepared, and bring a pencil. We were required to meet on our own time, to work together, to discuss what we wanted and how to achieve that." Collaboration: Chamber Music involves working together equally, sharing opinions and striving to come together to make something beautiful. Each individual voice is important, and so is the collaboration of the voices together. Leadership: There is no conductor! Each member of the group has to be the leader at different times to help the group come together. Responsibility: When there is only one student to a part, there is no ability to hide and each student must be responsible for learning his or her music! With such a small ensemble, attendance and punctuality also become very important; students must be responsible for regular, faithful attendance and being on time for rehearsals and/or coachings. Intonation: In small ensembles, students must focus and learn the skill of playing in tune. Performance Skills: The ability to perform in front of an audience is another skill that is honed in chamber music. Control of performance nerves translates to auditions, interviews, presentations, and any type of public speaking. And… it’s FUN! : Chamber Music is a great combination of playing music and spending time with friends!